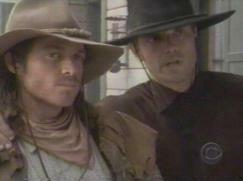 This website is dedicated to the men and women of the television series, The Magnificent Seven. For two short seasons, they brought adventure, excitement, dedication, love and honor into our homes. To these fine individuals we say, "thank you". In token of our appreciation, we offer up these pages. It is our hope that they can, in some small way, help to keep the legend of the Magnificent Seven alive! is about relationships. It is about the bonds that formed between seven men, their leading ladies, and the gentle folk that surrounded them. Come, sit back and relax as we take a closer look at the town of Four Corners and the men whose destiny it was to protect her. Partners, Friends and Brothers is a not-for-profit website. It is run by fans for the enjoyment of Mag7 viewers. No copyright infringement is intended. Over 100 screen saves of the seven guys and their ladies. Music, lyrics and screen saves combined together to tell the boys' story. Please allow time for the midi to load. 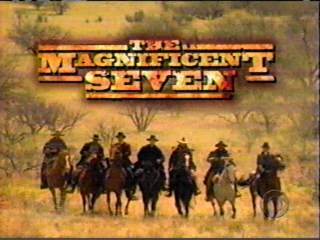 A Magnificent Seven alternate universe fanfic series. The ladies of Four Corners, plus the town folk and maybe even a few bad guys now and then. Index of the Magnificent Seven FAN FICTION written by S.E.Haigler, J.K. Poffenberger, and Shellie C. Williams. Links to other Magnificent Seven sites, resource guides, and web design pages. The fanfic challenge page. Currently only one up, but more to come soon.